The American court system presides over a wide range of legal issues, making it necessary for very specific and formulaic documentation to handle each court case efficiently. 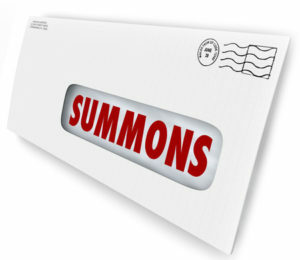 A summons is the first document to be created at the time a new lawsuit is filed, and it serves a number of important purposes. In general, any summons is a court document that states the names of the plaintiff and defendant, the title and file number of the case, the court and its address, the involved attorneys and their addresses, and instructions regarding the process and timeframe for the defendant to file a response. A summons is so important because it provides all parties involved in a lawsuit with the basic information necessary to participate and remain informed. An alias or pluries summons is the second summons served if the first is not able to be delivered successfully. What Are the Different Types of Summons? Summons can be delivered for a many different purposes, mainly relating to a civil lawsuit. Matters that result in the delivery of a summons include divorce, custody, and eviction. A divorce summons is delivered to one spouse when the other spouse files for divorce. It is required by law so a spouse does not have the opportunity to divorce in secret. A divorce summons also provides the other spouse with the opportunity to properly represent himself and his interests throughout the divorce proceedings. A custody summons, meanwhile, is sent from one parent to inform the other parent of a desire to have more parenting time with their child. Along the same lines, an eviction summons is delivered to a resident who has not paid his rent or mortgage and is being told to move out accordingly. If you receive a summons for any issue, it is critical that you read the information provided and follow the instructions to respond in a timely manner. Unfortunately, ignoring your summons won’t make it go away, and you will only have the opportunity to adequately represent yourself in court if you answer the summons.